Places of worship in Punjab have vivid accounts of local history, culture and the religious belief of the people living there for centuries. Hindu epics like Ramayana, Mahabharata and other puranic lores have particular relevance to the numerous temples that dot the landscape of Punjab, one of the most fertile lands in the country. 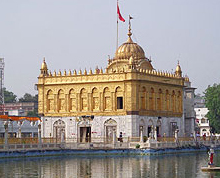 Known to be the land of Sage Valmiki, Ram Tirth in Amritsar goes back to the era of Ramayana. Located 11 km from Amritsar, the holy shrine has an interesting past. Consecrated by the appearance of Goddess Sita, Ram Tirth had been a witness to the birth of Lord Rama's two sons - Luv and Kush. Ram Tirth was once the place where the expansive ashram of Sage Valmiki was located. The sage is believed to have scripted many of his epic compositions at this place. A hut of Sage Valmiki is still found at Ram Tirth where he once lived. After giving birth to Luv and Kush, Devi Sita used to stay at this place for a considerable period of time. The evidence of her stay still exists in the form a well which, it is believed, was dug by Lord Hanuman. Devotees of Lord Ram and Goddess Sita flock to this place every year to offer their prayers to the respected deities. Ram Tirth is easily accessible by road transport from the city of Amritsar without any hassles. An emblem of devotion towards Goddess Lakshmi, the Durgiana Mandir flaunts a majestic architecture that has enough similarities with the famous Golden Temple complex (Harmandir Sahib). Also referred as the Lakshmi Narayan temple, the shrine was erected during the 16th century. The radiant temple was inaugurated by one of the popular leaders of Indian freedom struggle Pandit Madan Mohan Malviya. A sacred tank, several canopies and a dome at the centre are structures of religious importance to thousands of devotees who visit this temple every month. The entire planning of Durgiana Mandir located at the exterior of Lohgarh Gate, resembles the crafty look of the Golden Temple. Attracting both Hindus and followers of other faiths to its premises, the shrine has a beautiful sarovar within its vicinity. The deities of Goddess Durga, Goddess Lakshmi and Lord Narayana are worshipped with great fervour by the devotees. 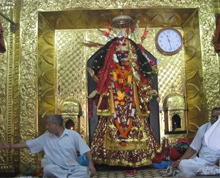 Built by a religious person, Bhagwathi Mandir at Maisar Khanna is dedicated to Goddess Bhagwathi Mata. At present, the temple located in a small village called Khanna has become a pilgrim centre for devout Hindus in North India. Owing its origin in the 17th century AD, the mandir tells an interesting story about its creation. A devotee Kamalu Bhagat, accompanied by a saint called Kalu Nath, was once going to the shrine of Jawala Mukhi which was near the borders of Khanna. On their way to the temple, Kalu Nath stopped at one point and started lighting a fire in order to offer prayers to Lord Jawalaji. But as soon as he begun praying, Goddess Bhagwathi Mata showed up and ordered the two devotees to worship her in their own village. 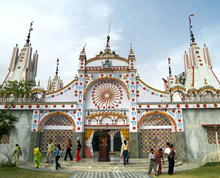 The temple is located in the heart of Jalandhar city and about 1 km from the railway station. It is believed to be more than 200 years old. The temple is dedicated to Goddess Durga and is one of the 51 Shakthi pithas in India. The idol of Lord Shiva is called Bhisan Bhairav. Devi Talab Temple has been renovated and a number of changes have been made to the old structure. A new temple has been constructed within the temple premises. 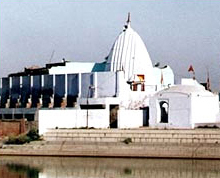 Beside the main Devi Talab Mandir is an old temple of Goddess Kali. One of the prime attractions of the temple is an old tank, which is considered to be sacred by the Hindu devotees. The temple has a structure resembling the Amarnath Cave temple in Jammu and Kashmir. One of the most ancient temples of the region, the Shiv Mandir, Gur-Mandi represents the deep religious fervour of Punjab. Agricultural advanced and industrially developed state of Punjab, also nurtures an intense faith in the "Supreme Being". Located in the heart of a busy market called Gur-Mandi, the temple of Lord Shiva bears relics of the brilliant architectural ability of the ancient times. Constructed by a Muslim Nawab of Lodhi dynasty, adjacent to the mosque of Imam Nasar, the age old temple is a living witness of inter-faith harmony which is a noteworthy feature of Punjabi society. One of the ancient temples of Punjab, Sodal Mandir represents the cross cultural synthesis of this northern state. The temple in the heart of Jalandhar city attracts many devotees of different religions to worship and seek divine blessings for eternal happiness. Sola Mandir is dedicated to a child God who was believed to possess supernatural and divine powers. The shrine is a living witness to the secular belief of the people of Punjab. According to legend, a local woman went to the river to wash clothes when herchild also followed her. Disappointed by her naughty son, she admonished him. However, the son who was none other than God in human form turned into a snake and parted from the poor woman. Since then the people of the region pray to the "Baba Sodal" who gives them solace and relieves them from all kinds of injustice. One of the most revered places, Panch Mandir is dedicated to several Hindu gods and goddesses. Constructed by Fateh Singh Ahluwalia, temple located in Kapurthala town bears the relics of a rich architectural legacy. The temple is an important hallmark of the small town of Kapurthala which draws several devotees from all over the state to seek divine blessings. As the name suggests, the temple houses numerous small temples that are dedicated to different gods and goddesses. The giant structure at the middle of the holy sanctum is encircled by many smaller temples. The temple displays the engineering skills of the people of the ancient times. Apart from being an important place of religious worship, Panch Mandir is also a celebrated place for archaeologists who throng the temple to study the rich architecture of a traditional society. One of the consecrated places of worship for the Hindus, Kali Devi temple in Patiala is dedicated to Goddess Durga. Located on Mall Road in Patiala just in front of Baradari Garden, the huge monument of the Kali Devi temple is an architectural wonder of the rich legacy of Punjab. The royal family of Patiala constructed this magnificent temple which has become a major landmark of this ancient city. Kali Devi temple draws many devotees from far and near who visit the temple toseek divine blessings for eternal happiness. Far from the hustle-bustle of the city, the calm surroundings of the holy temple provides solace to mind and soul of the devotees. The divine edifice is a living witness to the traditional rituals and customs of the Hindu religion that has being followed strictly down the ages to the modernday society. The temple rigorously adheres to all the age-old customs of Hinduism and inspires the devotees to do the same. 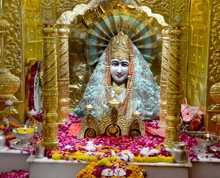 Mata Mansa Devi is dedicated to goddess Mansa Devi, a form of Shakti, in Chandigarh. The temple complex is spread of 100 acres of the Shivalik foothills in village Bilaspur, near Mani Majra, and Panchkula, 10 km from Chandi Mandir, another noted Devi shrine in the region. Both Bilaspur and Panchkula are just a few minutes’ drive from Chandigarh. It is one of the prominent Shakti temples of North India. Thousands of devotees visit the shrine from various parts of the country, and especially during the Navratri mela, this number rises to lakhs every day for the nine auspicious days. According to the legend, the head of Goddess Sati had fallen over here. The Mansa Devi temple houses two temples. The temple was established in the year 1815 A.D by the ruler of Mani Majra. Later a new temple was set up by the Maharaja of Patiala. 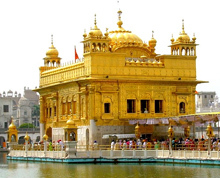 The holiest of Sikh gurudwaras, the famed Golden Temple or Darbar Sahib is situated in Amritsar, Punjab, and is regarded as the most sacred place on earth in Sikhism. The gurudwara also known as Harmandir Sahib is the symbol of the magnificence and strength of the Sikh people all over the world. In the evolution of the Darbar Sahib is the history and ideology of Sikhism. In the architecture of the gurudwara are included the symbols associated with other places of worship. The gurudwara is the steady example of the spirit of tolerance and acceptance the the Sikh philosophy propounds. 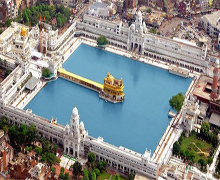 Harmandir Sahib was built on a 67 feet square platform in the centre of the sarovar (sacred tank). The gurudwara itself is 40.5 feet square and has a door each on the east, west, north and south. The Darshani Deori is an arch that stands at the shore end of the causeway. The door frame of the arch is about 10 feet in height and 8 feet 6 inches in breadth. The door panes of the gurudwara are decorated with artistic style. It opens on to the causeway or bridge that leads to the main building of Harmandir Sahib. The bridge is connected with the 13 feet wide 'Pardakshna' which is the circumambulatory path. It runs round the main shrine and it leads to the 'Har ki Paure' - steps of God. On the first floor of 'Har ki Paure', there is continuous reading of Guru GranthSahib. The main structure of Harmandir Sahib functionally as well as technically is a three-storeyed one. The front one which faces the bridge is decorated with repeated cusped arches and the roof of the first floor is at a height of 26 feet and 9 inches. At the top of the first floor there is a 4 feet high parapet rising on all the sides which has also four 'Mamtees' on the four corners and exactly on the top of the central hall of the main sanctuary rises the third storey. It is a small square room which has three gates. A regular recitation of Guru Granth Sahib is also done there. On the top of this room stands the low fluted 'Gumbaz' a dome having lotus petal motif in relief at the base inverted lotus at the top which supports the 'Kalash' having a beautiful 'Chhatri' at the end. The architecture of the Mandir represents a unique harmony between the Muslims and the Hindus way of construction work. And Harmandir Sahib style is considered the best architectural specimens of the world. Amritsar was founded in 1574 by the fourth Sikh guru Guru Ram Das. The Harmandir Sahib was designed by the fifth guru Guru Arjan who had the cornerstone laid by the Muslim Sufi saint Sai Hazrat Mian Mir on 28 December 1588. Guru Arjan completed the Adi Granth, the holy scripture of Sikhism, in 1604 andinstalled it in the gurudwara. There are four doors to get into the Harmandir Sahib which symbolise the openness of the Sikhs towards all people and religions. The present-day gurudwara was rebuilt in 1764 by Jassa Singh Ahluwalia with the help of other Sikh confederates. In the early 19th century, Maharaja Ranjit Singh secured the Punjab region from outside attack and covered the upper floors of the gurudwara with gold, which gives it its distinctive appearance and its English name. The Harmandir Sahib is considered the holiest among temples by Sikhs. The holiest text of Sikhism, the Guru Granth Sahib,is present inside the gurudwara during daytime and the holy book goes for 'Sukhasan' during the night time. Its construction was mainly intended to build a place of worship for men and women from all walks of life and all religions to come and worship God equally. Over 100,000 people visit the holy shrine daily for worship, and also partake in the free community kitchen and meal (Langar) that is a hallmark of all Sikh gurudwaras. Akal Takth - It faces the Golden Temple complex. Built by the Sixth Master Guru Hargobind (1606-44) in 1609, it has been the nerve centre of the Sikhism ever since. Baba Atal - A nine-storeyed tower built in memory of Atal Rai who died in 1628. He was the son of Hargobind and was called Baba Atal. Atal Rai died at the age of 9 years. He was called 'Baba' (an old man) because of his wisdom even at a young age. Guru ka Langar - A Sikh temple without a community kitchen would be inconceivable. Cooked food is served in the kitchen of the Golden Temple 24 hours to all visitors irrespective of religion, caste, creed and nationality. The expenses are met out of the temple funds. Nearly 40,000 visitors share the meals in the gurudwara every day.